A Pathfinder Society Scenario designed for 5th to 9th level characters (Tiers: 5–6 and 8–9). You and your fellow Pathfinders are sent to Katheer, the shining capital of Qadira, to witness the wedding of Pathfinder Faireven to the wealthy and beautiful Lady of Silver and bring back a trove of relics given to the Society as part of the wedding dowry. When the wedding is disrupted by unscrupulous thieves, you soon find yourself dodging double-crosses, accusations of grave robbery, and worse. You must find the relics soon, or risk facing the eternal expulsion of the Society from the treasure-filled deserts of Qadira. This scenario is designed for play in Pathfinder Society Organized Play, but can easily be adapted for use with any world. This scenario is compliant with the Open Game License (OGL) and is suitable for use with the 3.5 edition of the world’s most popular fantasy roleplaying game. Got a fun opening scene, but the remainder seems a bit disconnected, and there's some HEFTY railroading. Overall, the scenario could use some modernizing, and it hasn't aged well. Great opening scene.. but that's about it. A lot of local players hyped this scenario, so when I got round to playing it, I was expecting a lot. I’m sorry to say it didn’t deliver. Don’t get me wrong, the start of the scenario is excellent. The location in combination with what happens shortly after the party gets there works like a charm to set the scene. It’s by far the highlight of the scenario. The rest of the scenario just came across as a bit random. I felt like the GM and another player (who GM’ed numerous times) really had to guide the party in the right direction a bit too much. While I’m sure there’s a decent storyline, I felt like I was missing it a little. There’s plenty of opportunities to partake in roleplay with NPCs. People who enjoy that kind of interaction will likely have a blast this scenario. The combats however are outdated, as others mentioned below. I know people say there’s strength in numbers, but this time around the mooks just die too quickly. At times they didn’t pose a challenge at all, which is weird if the party is out of tier and playing up. Due to time-constraints, we had to call the boss fight rather early (even though we wouldn’t have struggled there at all) and sped up some of the investigation. Come to think of it, I must have missed a fair bit of the storyline because of that so I'll raise my rating by 1. However, right now I have to admit I’m far from impressed by this scenario, other than the opening scene. I honestly don’t see why some of my friends love this scenario so much. For now I’ll just put this scenario down as something I might want to revisit in order to find out, but I am also aware that there are other scenarios that I'd much rather replay instead. I can't in good conscience recommend this scenario. Like most S0 scenarios, you can see this was Paizo's playtest season, and they didn't have the proper difficulty down yet. This one leans in the easy direction. The story however is excellent. It's got some fun twists, and really shows off the Society "growing up" to be recognized as being more than your average tavern filled with murderhobos calling itself an adventurer's guild. If Paizo ever gets around to updating S0 scenarios, this one should definitely be upgraded to proper Pathfinder rules. It's too good to languish in the 3.5 dungeon. This scenario is very weird, but in a good way. The story makes some unexpected twists and turns that shake up the safe feeling I've had for a while. Seasons 0 and 1 are a bit wild and wacky, and I love them for it. It also has some problems common in those seasons, but the upsides outweigh the downsides, and it's definitely are worth playing it. Well, first of all, the opening act. As I alluded to in the title, this scene must've been inspired by Aladdin. You name an element of that song, and it'll show up there. I recommend giving your players homework to listen to/watch this song to get into the mood a bit. And when combat does break out... Whoo boy. It's such a frantic mess, and I (and my players) love it. There's definitely a feeling of "WTF is going on here?" that you don't get too often, and the chaos is amazing. And then that turn about three-quarters through... That's a great part for players to roleplay. My players loved it. Again, a big WTF moment that's great to see played out. Sadly, as great as this scenario is, it has some downsides. This is a very thin scenario, and a lot happens in it, so a lot of stuff needs to be condensed or cut. Some connections are tenuous or not very clear, and I had to shove my players onto the right path every now and then. They also stumbled on some plot holes every now and then I couldn't really explain away. Also, combats are pretty underwhelming. I GMed the high tier, and the final combat didn't even last a single round. This was a case where the author thought that throwing more low-level mooks at you makes up for the lack of challenge per mook, but that doesn't work when you already have access to Fireball. The advantage in numbers seems daunting, but when a well-thrown Magic Missile can knock out a single combatant at tier 8-9, your combat won't last long. Similarly, 30 HP mooks around a boss with double that amount, in a Fireball formation doesn't really matter. My six-player party completely annihilated the encounters without being really in danger themselves, and my guess is that a low-tier group could play up without too many problems. I've heard rumours of season 0 and 1 rewrites. If that's true, I wholeheartedly nominate this scenario for a revision. It's a great scenario as it is right now, but it could be even greater if it got the care and attention a season 7 scenario currently gets. Bottom line: play this scenario with a group of people who really want to roleplay. There's ample opportunity for that here, and I often had to cut off my players' roleplay because we had a scenario to finish. An invitation to a wedding - in the Qadira capital of Kadeer, no less - should be a welcome respite from the usual rigors of Pathfinder service, should it not? 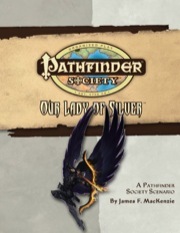 The party's latest summons, to the Pathfinder Lodge in Kadeer, finds them issued invitations to a high society wedding between a local merchant prince's daughter - the Lady of Silver as she is known - to an up-and-coming Pathfinder, and they are to represent the Society and take receipt of some antiquties the merchant has promised to gift to the Pathfinders during the wedding feast. For once, there is no convoluted backstory for the DM, just a simple description of the situation and a plot summary that shows how such an inviting proposition as being a wedding guest can go so horribly wrong. How the party comes to be in Kadeer in the first place is not explained: as a convention scenario just take it that they're there, if you are running a more coherent campaign you'll have to get them there from wherever they were last. Once they have been given their instructions and had a chance to undertake any errands or whatever they want to do before the wedding the next day, the adventure moves on to the wedding itself in the temple of Sarenrae, and afterwards to the feast in the bride's parental estate. It's a splendid affair... until all hell - or at least several lions and an elephant - breaks loose. From then on in, it's a mix of investigation and combat as the party attempts to retrieve the artefacts which of course got stolen during the chaos, unravel the plot behind it all... oh, and stave off stray rumours that the Pathfinder Society was behind it all that end up with them facing the justice of the Satrap himself! It's an exciting ride all right, even if rather railroaded at times. The setting is exotic, the dangers real and thrilling and those who come out on top will have earned the renown that they gain. Of course, if the players REALLY screw up, they could die and ALSO cause the Satrap to expell the Pathfinders from Qadira. Never underestimate the ingenuity of those truly determined to do everything the wrong way: I'm waiting to hear from a group that plays the adventure with a party of CHA 6 half-orc barbarians. 7 is the minimum for any ability score under v1.1 rules. Don't try to muddy the waters by using facts! I still want to hear of some group trying this one with a bunch of combat-optimized yahoos. When I ran this one the CHA 6 half-orc wanted the party wanted to fight it out instead of going quietly. They could have done it. We never fought it out, but only because the CHA 26 bard knew he could talk his way out of anything. Like the two Andorans in my game that for the past two adventures murdered the NPC they were supposed to convert to their cause? A party like that?